This calendar is available as a set of .pdf files to print yourself, in either A4 or A5 size. The A5 ones print to the lower half of an A4 sheet, and if you turn the sheet over end-to-end and print a different month on the other side, you can fold six A4 sheets over to make a booklet with one month to a 'page'. Print January and December on the same sheet (opposite sides and opposite ends of the paper too), Feb and Nov likewise, etc. The times of the lunar phases (full, new and first and last quarters), any solar or lunar eclipses, and the solstices and equinoxes, are shown for each month. The movements of the sun and moon into each zodiac sign are also shown. 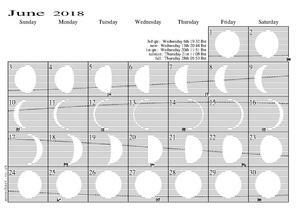 The dotted line runnning across each day shows the Moon's declination, which gives an indication of how high in the sky the Moon gets that day. All the times are given for the U.K. time-zone, using GMT in the winter months and BST ("daylight-saving" summer time) in the summer.